So you decide to watch The Way Way Back, possibly for no particular reason at all. You do some research online for fun. You see the tagline, which says “Everybody has a summer that changes their life”. Red flag – this sounds like a million other movies. You hear the music used in the trailer. Now it feels like a typical coming-of-age indie you’ve seen before. Then you look on Wikipedia – it premiered at Sundance. Hmm. Sounds like the kind of movie that would pop out of there. Then you watch it. And you were absolutely right about everything. This movie hasn’t done anything new, you can count the tropes as you see them coming. But when this 103 minute movie concludes, another thought dashes across the brain – this was actually good. Yes, despite all of the familiarity, you realize you just watched a movie that was charming, sweet, funny, well-acted and relatable. And that over-powered its weak spots. Whaddya know? After arriving at the house, it seems that Duncan will be sentenced to a long vacation of nothing, with perhaps the most exciting event being spending time with the bad tempered, lazy-eyed, action-figure collecting young son of Betty (Allison Janney), the woman who lives next door. But after meeting Betty’s older daughter Susanna (AnnaSophia Robb) and getting a job at the local water park under the supervision of the place’s laid back and wisecracking manager Owen (Sam Rockwell), Duncan’s fortunes begin to improve and it becomes clear that this will be anything but a boring summer. 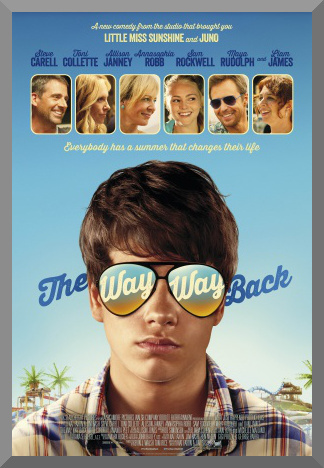 The Way Way Back is the directorial debut of writers Nat Faxon and Jim Rash, who won an Oscar for The Descendants. Their screenplay for this film isn’t the strongest part of the movie, but it allows itself for great enhancement for the actors, who pull it off with skill. The best performance here is from Rockwell as Owen. He plays the cool informal figure that Duncan clearly needs, and the performance is pulled off with such charisma and smoothness that Rockwell seems like he’s on the cusp of running away with the entire movie. But there is still room for others. Liam James fits the main role very well, and as we see his personality evolve over time, the viewer will likely see bits of themselves in nearly every turn. In the supporting cast, Steve Carell’s Trent is strikingly unsympathetic, a departure for the actor. However, he handles it in such a manner that we see that this is still a human being trying to be good, despite how scummy he gets. AnnaSophia Robb provides a solid love interest, but is unevenly written, leaving us with a character that probably could have been fleshed out more, in stark contrast to many others. Collette, Janney, Rob Coddry, Maya Rudolph, as well as Faxon and Rash themselves round out the acting roster. They each add something overall – never overbearing, but enough to make a noticeable difference. If I had been much older than I am now when I viewed The Way Way Back, I have the feeling that I would have been less forgiving of its reliance on old ideas and themes. But there’s a certain comfort to its reliability now, and that’s enough to push this into the territory of a recommendation. It’s not the emotional experience that the best movies in the coming-of-age genre are or remotely close to greatness, but The Way Way Back is still pleasant and likable, easy to digest with characters and a story worth caring for. Solid review… saw this last month, and completely agree. Quite familiar and bland concept… but really excels thanks to Rockwell’s performance and some of the writing.